A few shots from last saturday. But I'm guessing all of this is pretty much self explanatory. We had a tiny civil ceremony accompanied by a handful of friends. 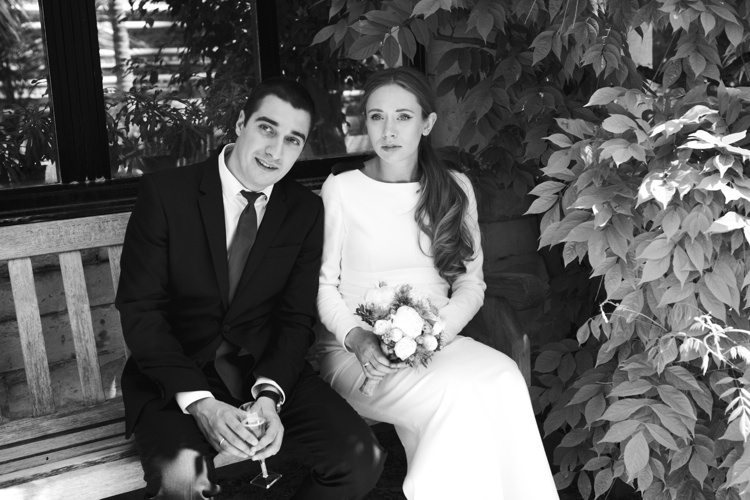 I managed to finish the dress just the night before the wedding and Céline sandals were more than perfect with it. Not hoping for any comfort at all I threw a pair of Chloé slides in the car thinking I would probably last about an hour in heels (well, things worked out better than I thought and I probably managed two hours at least). I wore no jewellery that day except my engagement ring, which was promptly stacked on top of a wedding band. And flowers were a lovely gift from our witnesses. I'm not big on weddings in general, but I do believe in a value of family and living a life together with your partner. A giant party would have never been up my alley. And now with a baby coming in about a month all I can physically bare is a dinner with close friends culminating well in time before sunset and a nine in the evening curfew moment and another fifteen minutes of with my feet on a stack of at least four pillows. Happy monday evening to all of you guys! ps. The dress accidentally happened to be in line with my current ss'14 collection, which you can take a look at over here. Leather epaulettes made things slightly more graphic and so much more me, yet there was still enough 'wedding' going on in that floor length number. Oh, this is beautiful, you look very happy :) Wishing you two all the best!!! Congrats! Oh beautiful! Congratulations. Which botanical garden did you visit? Congratulations, so happy for you ! Congrats!!! How beautiful! I love when couples stay true to who they are and do what feels right for them. I love that last picture so funny and sweet. Wishing you both a lifetime of happiness! Ahh, congrats Elena! Stunning pictures.